A wind driven, roof mounted, quality polymer based ventilator to exhaust heat & moisture from the roof space of a home without the use of electrical energy. The high quality, roof mounted, polymer ventilator combines modern design with high tech features for guaranteed long lasting performance. 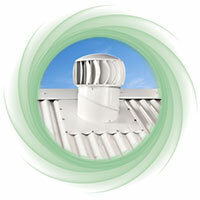 Edmonds SupaVent is a wind driven turbine ventilator designed to exhaust heat and moisture from the roof space of a home, without the use or electrical energy. Constructed from light-weight, high quality polymer, it comes with a 15 year warranty for long lasting peace of mind and comfort in your home. Available in a range of 10 colours to suit most metal and tile roofs.